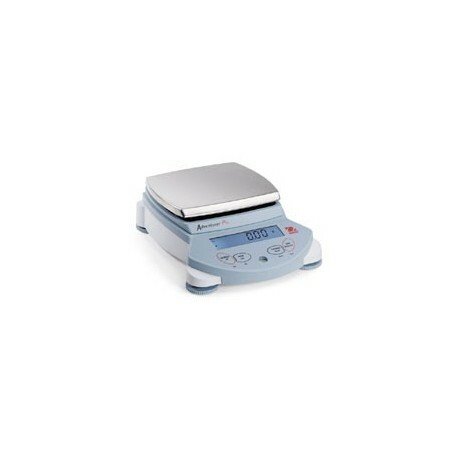 The OHAUS ADVENTURER PRO ELECTRONIC BALANCE is the latest in the Adventurer line of Precision Balances. Designed for use in laboratory, industrial or education applications, the Ohaus Adventurer Pro continues the tradition set by the original Ohaus Adventurer series. Featuring easy-to-use four-button operation with intuitive man-machine interface, a new 2-line brilliant backlit display, multiple weighing units, seven application modes, and RS232 connectivity, the Adventurer Pro is the precision balance for all your needs! • Easy Access, Frameless Draftshield with Removable Doors – All doors, including the front and back glass panels, disassemble in seconds, and together with a stainless steel bottom, make it fast and easy to clean. software that utilizes text prompts to guide users through application use and balance setup. QuadraStance incorporates four feet to provide superior footprint stability on any surface. • Flexibility of Available Options – Ensure weighing accuracy with InCal™ internal calibration.A factory installed USB or second RS232 interface allows connection to multiple peripherals. • GLP/GMP Data – Complete built-in GLP/GMP capabilities including date, time, balance serial number, user ID/project ID, and results.